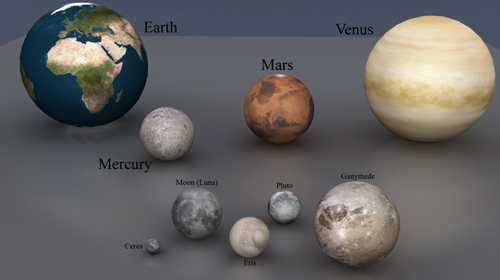 Pluto (center), to scale with some of the other small planets in our solar system. On Sunday, Oct. 17, at 3:24 Universal Time, we passed the halfway mark in the number of days from launch to Pluto encounter – the last of our halfway milestones en route to Pluto! From here, we have fewer days in front of us than behind us. Since I last wrote here in May, a lot has taken place on the road to Pluto. Most significantly, our spacecraft and its scientific payload successfully completed their fourth annual checkout (ACO), took some wonderful cruise science data, performed a flawless course correction, and then re-entered hibernation as planned on July 30. We also had a couple of notable, unplanned events. The first was a self-reset of our main (i.e., command and data handling) computer on July 2. Such resets have occurred a few times since launch, most recently in 2008, and our spacecraft operations team has gotten very good at handling them and then re-engaging the mission timeline. In fact, within barely a day, by late on July 3, New Horizons was back on its flight plan – not bad considering the team is dealing with a round-trip communication time (for signals between Earth and spacecraft) of about five hours. 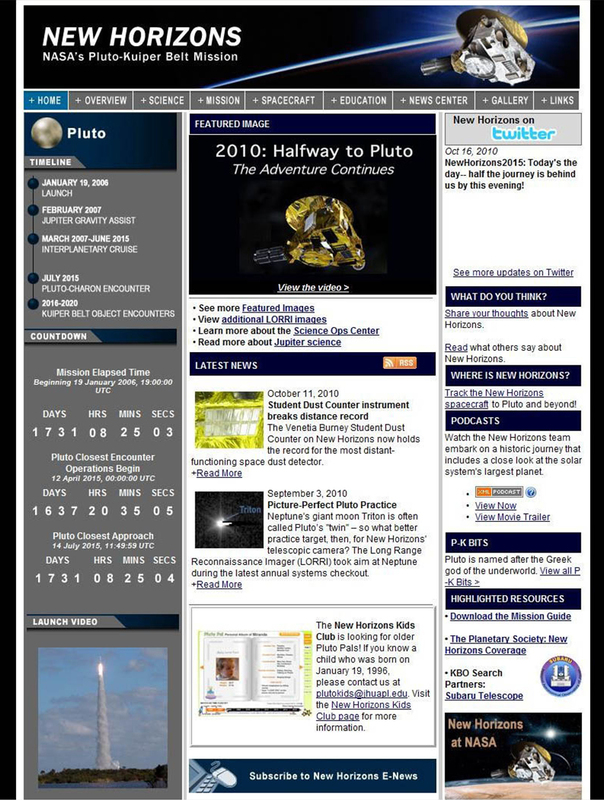 A ‘halfway’ home page screen shot, captured and provided by Eletheia Duvall. The other unplanned event came just over 10 days ago. On Oct. 6, when we checked for our monthly telemetry data from the spacecraft, there was no signal received on the ground! This had never happened in almost five years of flight, and it could have been very serious, as it could have meant a major malfunction aboard the spacecraft. But as it turned out, the problem wasn’t on the spacecraft at all – it was a mis-configuration of the receiving antenna. After resolving that, we received the hoped-for telemetry from New Horizons later in the day. Needless to say, we all had a little more stress that day than we’d planned, but the telemetry did show that everything aboard our spacecraft was functioning as it should. 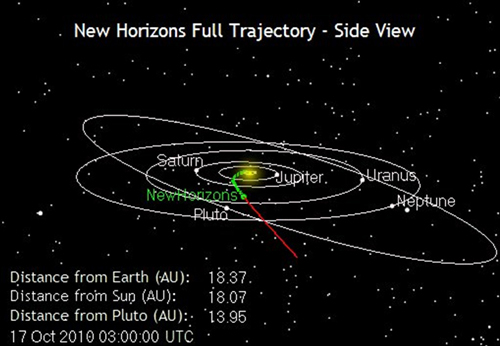 Our progress on the path to the Pluto system, captured near the halfway mark (in time) toward the Pluto encounter. What’s next on the spacecraft’s flight plan? We’re now just three weeks from our next wakeup from hibernation, which will occur on Nov. 9. The main purpose of the 10-day November wakeup will be to re-point our communication antenna to account for the motion of the Earth around the Sun, and to gather tracking data for our navigation team. We’ll also be uplinking the command load (i.e., the set of detailed computerized instructions) that will direct spacecraft activities through Jan. 2, when we’ll do another 10-day hibernation wakeup with similar goals. This has become our standard pattern: a long hibernation wakeup for a summertime checkout and two short wake ups in November and January for tracking and antenna re-pointing. We often use the brief November and January wakeups to accomplish other goals as well, and this time will be no different. For example, next month we’ll be downlinking a few last portions of science instrument data from ACO-4, and we’ll also be “dumping” Student Dust Counter cruise science data. 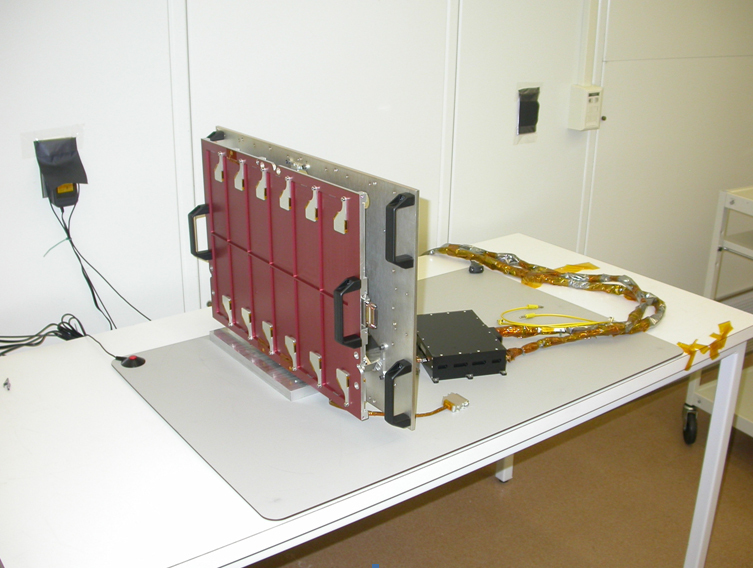 In January, we’ll again dump SDC cruise science data and also be erasing some onboard solid-state data recorder segments that have now been transmitted to terra firma. Continuing planning for Pluto encounter, concentrating primarily on the four days prior to and the four days after the nine-day closest approach period. Conducting a thorough review of the onboard fault detection and protection software we’ll use during the encounter. Studying ways to increase our science studies of the space environment of the outer solar system by taking SWAP and PEPSSI particle-instrument measurements while the spacecraft hibernates. Organizing proposals for observing time on large ground-based telescopes to search for Kuiper Belt object flyby targets next year. Planning for next summer’s annual checkout, ACO-5. Speaking of ACO-5, it’s going to be a sleeper compared to ACO-4. Our basic mission cruise plan is to alternate heavy and light ACOs in even and odd numbered years, respectively, and that pattern will continue in 2011 and 2012. The simpler checkouts in odd numbered years save money (because they require less planning) and fuel (because we don’t spin the spacecraft down and conduct pointed science-instrument observations); they also give our small team more time to devote to Pluto preparation activities than in years with a heavy-duty ACO — like ACO-4 this year. Still, although ACO-5 will be a low-activity load with no pointed instrument observations or course corrections, we will conduct checkouts of all of our backup systems, perform some needed upgrades to our fault protection software, and turn on and check out each of the seven scientific instruments we’re carrying. In addition to all the activity that’s been taking place over at New Horizons operations, there are a few more tidbits of mission-related news I’d like to share. One is that planetary astronomer Scott Sheppard, of the Carnegie Institution of Washington, announced that he’s found the first asteroid in Neptune’s trailing Trojan zone (i.e., the L5 point), which New Horizons will fly through in 2013-2014. While the object Scott found (called 2008 LC18) is not within our reach for a bonus flyby, its discovery shows that additional and potentially closer Neptune Trojans that New Horizons might be able to study could be discovered in the next three years. 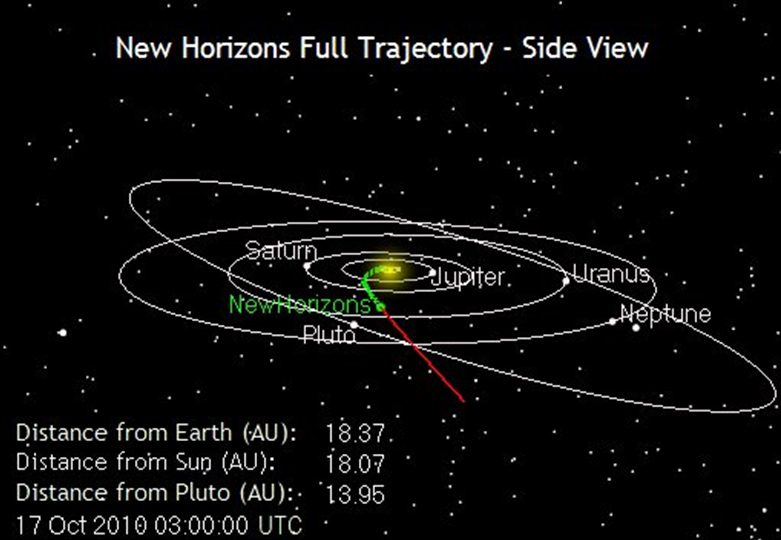 Another item to note is that NASA has approved our request to move up the full dress rehearsal of our Pluto encounter aboard New Horizons from the summer of 2014 to the summer of 2013. We wanted this change so that if this test uncovers any problems, we won’t be trying to resolve them and re-test with less than a year to go before Pluto. And finally, as New Horizons passed the 18 AU (astronomical unit) mark from the Sun earlier this month, our Student Dust Counter (SDC) took the record for being the farthest operating dust detector ever from the venerable Pioneer 10 and 11 spacecraft, whose dust detectors quit operating at this distance back in the early 1980s. From here on out, SDC is truly exploring uncharted territory for cosmic dust science! 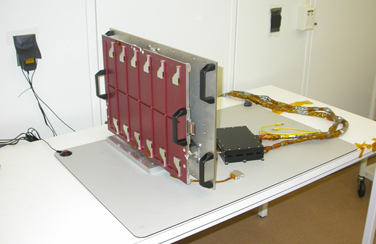 The Venetia Burney Student Dust Counter instrument, with protective covers on its detectors, awaiting installation on New Horizons in 2004. Well, that’s my update for now. Thanks again for following our journey across the ocean of space, to a new frontier – and keep on exploring, just as we do!